CALVIN Abueva's volleyball background came to the fore when the gung-ho Alaska forward made a crucial save late in an 83-80 victory over San Miguel in Game Two of the PBA Philippine Cup Finals. With Alaska clinging on to a one-point lead, 78-77, inside the final two minutes, Abueva chased down an airball and kept the possession alive by putting the ball back in play with a volleyball-like hit. The ball ended up in the hands of a teammate, leading to a Chris Banchero basket that gave Alaska more breathing room against a San Miguel side that showed a lot of fight in the absence of injured June Mar Fajardo. Abueva played volleyball in his early years because there wasn't a basketball team in his school, but he later said it was no more than instincts that came into play when he made the crucial save. “Talagang kung save, save lang. Kung sa kanila, sa kanila. Buti na lang, sa amin napunta tapos na-convert,” Abueva said of the play. Abueva’s save was his lone offensive rebound but the former Rookie of the Year grabbed 11 caroms in all in the win that gave Alaska a 2-0 lead in the best-of-seven championship series. “Okay naman. Walang problema sa depensa at opensa ko. ‘Yun na talaga ginagawa ko,” Abueva said, playing down his contributions. 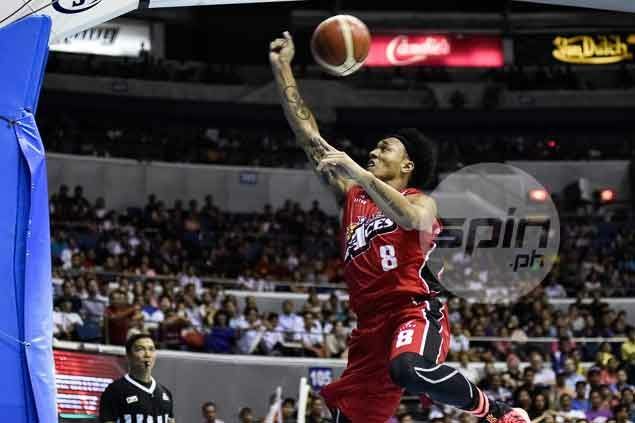 When he finally obliged, Abueva said the series is still a long way to go. “Halfway na pero hindi pa ganun kadali. Nakita niyo naman na naka-survive lang kami,” said Abueva.